Zhang Yimou, who has demonstrated his visual mastery across a wide range of film genres, extended his portfolio into the conventions of film noir with his dark period piece Shanghai Triad. Zhang’s previous effort, To Live, was an outstanding expression of existentialist struggle and had garnered enormous prize abroad, but its reception had gotten him into hot water with the Chinese government. That film’s depiction of the misery imposed on ordinary people by autocratic and disruptive Chinese government “campaigns” had led the authorities to ban it from being shown in China and also temporarily ban Zhang from filmmaking. So with Shanghai Triad, Zhang moved into safer waters by making a supposedly conventional gangster film set in 1930, prior to the Communist takeover. This might lead one to expect him to produce an ordinary escapist thriller, but with Zhang’s subtlety of expression on display in any film he makes, there will be always temptations to consider larger issues. So Shanghai Triad has its share of interesting themes lying behind the events depicted. The story follows the experiences over eight days of a fourteen-year-old boy from the countryside who has been sent to the big city to work for the gangster operations run by some of his clan members. In China, especially in the warlord-torn period of the early 20th century when institutional securities were largely absent, trusted relations were essential; and clan membership was the fundamental trusted connection. The paranoid atmosphere of mistrust in those days was of course even more heightened in the underworld run by the big gangs, or “triads”, so clan loyalty was heavily counted on. Merely by being a distant member of Boss Tang’s Shanghai gang, the teenage boy Shuisheng had a free ticket to potential material security as a gang member. But of course at this early stage he was going to be just a humble servant for his masters. The first phase covers the first two days of the week-long events of Shanghai Triad. Tang Shuisheng has arrived by boat in Shanghai and is met by his uncle Tang Liu, who is a minor operative in Boss Tang’s gang. This gang is said to be the dominant triad gang in Shanghai and therefore, by means of its various illegal operations, is turning over and accumulating untold wealth. In these first two days, which cover about forty minutes of screen time, Liu explains to the boy (and hence to the viewer) the layout and protocols of the gang. Very early on, Shuisheng also happens to witness a gangland killing of some rival gang members, who are ambushed and then killed in cold-blood by a dapper young Tang gang operative whom we will later learn is named Song and is Boss Tang’s “number two” man. This short violent scene gives the viewer and Shuisheng a taste of the kind of world that the boy is entering. Shuisheng is clearly ignorant of city ways, and he remains silent and wide-eyed as Liu shows him the ropes around the gang’s quarters. Shuisheng’s assignment is to serve as the personal servant of the boss’s beautiful mistress, Bijou (played by Gong Li), who is a stage singer and dancer at the fanciest nightclub in Shanghai. We also learn that there is a rival gang run by a certain “Fat Yu” and that it was members of that gang that Song had gunned down on the first day. Boss Tang is unhappy that the status quo has been disturbed by Song’s impetuous murders, and he reprimands his underlings, not out of ethical or moral concerns but because the “balance of power” may have been disrupted. It is always important, he insists, to maintain “face” (i.e. honor, a Chinese obsession). 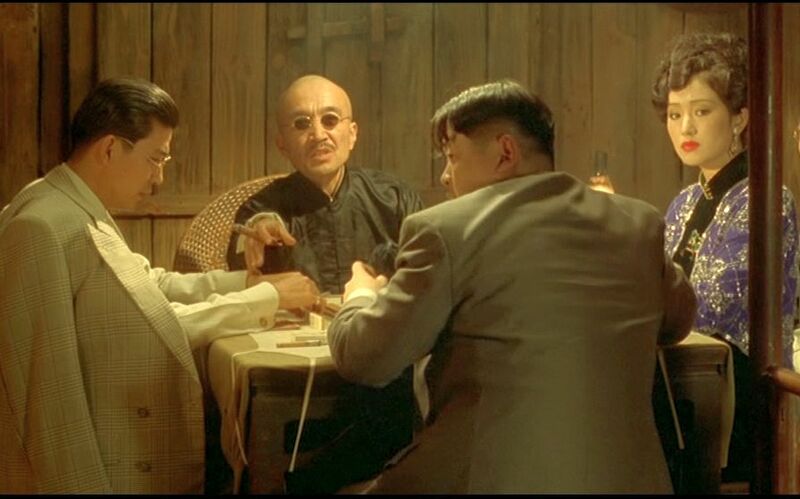 Boss Tang says he needs to make a cordial visit to Fat Yu and play mahjong with him so that Fat Yu can maintain face, and thus a gangland war can be avoided. We also learn at the close of the second day of the story that Bijou is two-timing Boss Tang by having a secret love affair with number two man Song. Bijou sings two stage numbers during this section of the film. The first one, “Pretending”, is a sassy, in-your-face song about temptation and is Boss Tang’s personal favorite. The second song, “Moonlight”, tells of secret longing for moonlit trysts and is the favorite of Song. The revelation that Boss Tang hates the song “Moonlight” gives the viewer a hint that Boss Tang may not be entirely oblivious of Bijou’s straying and that impending conflict is on the menu. The second section begins with Bijou in a tuxedo singing a sultry nightclub song. 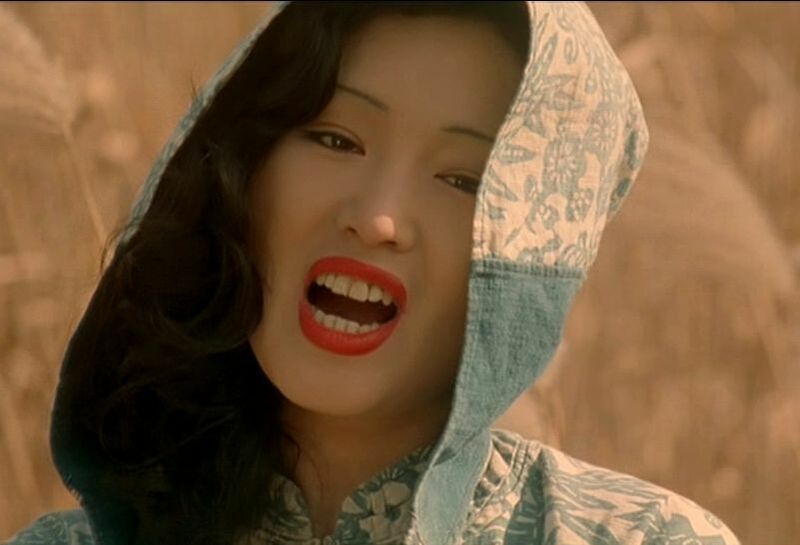 The scene evokes images of a similarly garbed Marlene Dietrich singing on stage in Josef Von Sternberg’s Morocco (1930), and it may remind viewers that the extended Zhang Yimou - Gong Li onscreen and offscreen partnership has been likened to the Sternberg-Dietrich association. The key event in this section, though, is that while Boss Tang was visiting Fat Yu’s premises to make amends, he and his men were ambushed. Many of Tang’s men, including Uncle Liu, were killed by Fat Yu’s men. Boss Tang makes the tactical decision to retreat to safety with a few key operatives, including Bijou and Shuisheng but not Song, to a secret island refuge outside Shanghai. While on the island, the focus shifts fo Bijou. She befriends a friendly and straightforward peasant woman on the island, Cuihua, whose 9-year-old daughter, Ajiao, befriends Shuisheng. We eventually learn that although Bijou has continually derided Shuisheng as a country bumpkin, she, herself, was a peasant coming from the countryside, too. The whole tone of this section is around Bijou’s sense of lost innocence and her realization that life in the glitzy city has corrupted her and not brought true happiness. She longs for the simple, innocent, and authentic existence of Cuihua. Boss Tang announces that his deputy Song is going to pay a visit the group on the secret island. While out in the high weeds attending to his bodily functions, Shuisheng overhears a nearby but unfamiliar voice saying, “doesn’t Song mind about killing Bijou?”. These words must come from Song’s newly arrived contingent, and they must be bent on mayhem. The idea that Song wants to kill Bijou seems bizarre to us at that point, but it is not long before the entire film is engulfed in treachery and betrayal. Boss Tang has set up Song and killed the eighteen men who had accompanied Song to the island. Tang takes Song prisoner and accuses him of secretly working for Fat Yu and also seducing his woman (the ultimate face-destroying humiliation). In revenge for these betrayals, Tang has Song buried alive along with eighteen other men who had been killed earlier. Tang then smilingly tells Bijou that he will kill her, too. Furthermore he has already had the innocent Cuihua killed (as well as, earlier, Cuihua's lover) and will make her daughter Ajiao his future concubine. Everything, Tang explains, will be done discretely so that he can preserve his public face and maintain his vital image of mastery. The final shots show Boss Tang and his close associates on a boat headed back to Shanghai. 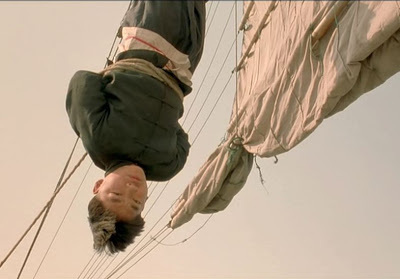 Shuisheng is shown hanging upside down from a mast. 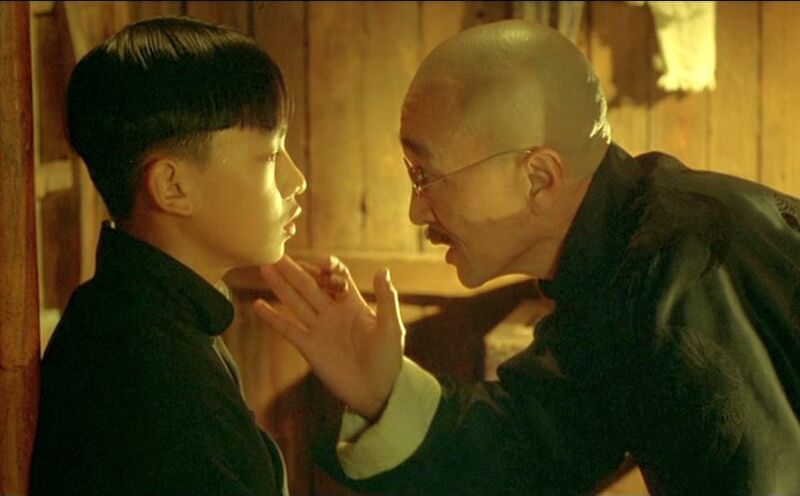 Although he hadn’t done anything wrong, Tang explains that this is part of Shuisheng’s essential training of pain and discipline for future life in the gang. There are some general themes of interest in Shanghai Triad, beyond those of betrayal and revenge. Zhang Yimou’s earlier films had often shown protagonists struggling to exist within a stifling social environment – either a social milieu imposed on people by outmoded customs or by the ill-advised autocratic polices of Communist officials. As a consequence, many commentators viewed Zhang as a social critic, a label that he has resisted. But I think Zhang’s general perspective is better seen as representing a more personal, existentialist perspective of the individual trying to make his or her way in a difficult world – and thus not from a top-down perspective that overtly directs criticism on social structures. Here in Shanghai Triad, too, we see a similar situation – a stifling environment. Only this time that oppressive environment is the ruthless gangland underworld, where empathy is only seen as a sign of weakness. But if Zhang’s view is individual, rather than social or structural, where is the individual narrative focus in Shanghai Triad and what is the outline of its associated “journey”? In the first section of the film, the narrative focalization is on Shuisheng, but we never get feeling for his reactions. He is just an innocent witness who has no impact on his surroundings. We never have a feeling for his goals, and whatever impact his environment and associations have on him is obscure. After that first section of the film, the Shuisheng narrative thread fades to the background. Thereafter the narrative focus shifts over to Bijou and her relations with Tang, Song, and Cuihua. But Bijou is crushed in the end, and her life of pretense is exposed as the powerless fantasy that everyone suspected. So the final narrative thread shifts to Tang. 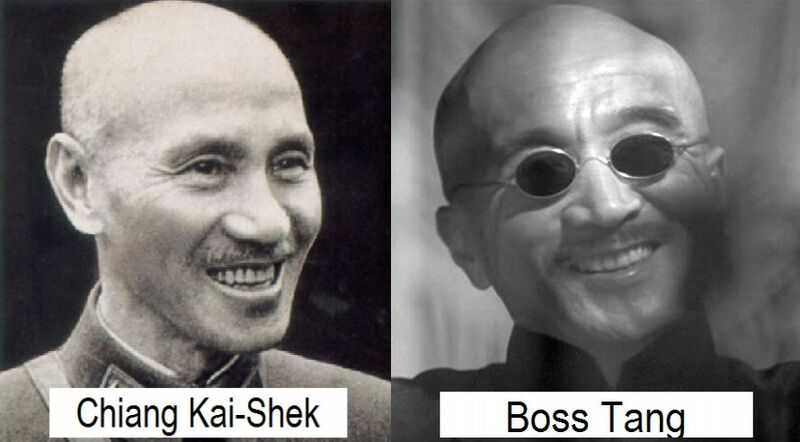 Boss Tang is initially shown in the film as something of an avuncular, almost congenial, supervisor of his gang. In his mild-mannered way, he indulges Bijou and admonishes Song for his disruptive actions. He seeks peace with Fat Yu, only to be double-crossed by the ambush that leaves him seriously injured. We are also aware that he is being two-timed by Bijou and Song. So Tang seems vulnerable early on, and we may be moved to have some sympathies for him. By the end of the film, though, we see Tang as a cruel, almost satanic, manipulator of all those around him and completely devoid of any human compassion. We have been double-crossed, too, into sympathizing with him early on. At the end we see the final, “true” perspective that Zhang wishes to leave with us. Tang lives rigidly by his artificially imposed set of rules. Anyone who disobeys those rules is heartlessly eliminated. The decadent Shanghai world shown in the film is one of phoney, ostentatious consumerism that comes from the outside and is clearly not the real, authentic China that is supposedly represented by Cuihua and her daughter Ajiao. Bijou, herself, is the embodiment of how authentic Chinese beauty has been corrupted by fantasy images of glamour and false romance. Driving this fantasy machine of casinos, flashy glamour, and easy virtue is the criminal underworld that is steeped in cruelty and fear. But beyond this stark contrast between sin and innocence on an individual scale, there is also a larger cultural perspective – that of the general cultural decadence of Chinese life in the 1930s and the apprehension that the corruption and disorder of those days may be returning to modern China. In those days China was inefficiently governed by the Guomindang (Kuomintang or KMT, the Chinese Nationalists), which were locked in a power struggle with the Communists. Since the Communist takeover, the KMT have always been demonized as utterly corrupt and lacking in basic human values, turning over the country’s wealth to profiteers and gangsters. In Shanghai Triad, Boss Tang can be seen operating at the core of this semi-organized and ruthless power system that has a monopoly on coercive power and snuffs out all sense of decency and compassion. I doubt that it is coincidence that Tang’s visage bears more than a passing similarity to that of former Guomindang leader, Jiang Jie-Shi (Chiang Kai-Shek – see the accompanying figure). Jiang Jie-Shi, of course, was responsible for the notorious 1927 Shanghai Massacre of Communist party members that led to the irrevocable split between the Communists and the KMT. So despite Zhang’s avowed movement to a more traditional gangster film genre, he has again employed his individual narrative perspective to present something that can be interpreted to be a social critique. But this time his critique is more in line with the official view of the Chinese authorities. This may represent something of a thematic turn for Zhang, but not nearly as marked as the one displayed later in Hero (2002), which expressed support for the idea that the demands for social stability and security justify totalitarian statism (see my review of Hero for further discussion of this topic). Cinematically Zhang brings this dark underworld to light with his characteristic sense of atmospheric color and composition. It is true that there are perhaps too many lingering tight closeups of Shuisheng, whose character remains opaque throughout and doesn’t come into any further light through such constant attention. But in general the point-of-view visual style employed in the film works pretty well, and is well supported by many fluid tracking shots that give one a feeling of movement through an unfamiliar space that is only gradually becoming revealed via that movement. The performance of Gong Li, as Bijou, deserves special mention. As I remarked above, there was a special relationship between Zhang Yimou and Gong Li, and it has been compared to that of von Sternberg and Marlene Dietrich. Zhang and Sternberg were both deemed to be cinematic Svengalis, with exclusive powers of calling forth the bewitching capabilities of their proteges. Each actress was said to be the embodiment of her director’s romantic fantasies. I am not sure about that, but there is something unique about Gong Li, and I have remarked about her more extensively in my review of Raise the Red Lantern (1991). There is something about her that suggest action, not just passive beauty. Like Dietrich, she has a beautiful figure, but this is never exploited or presented suggestively but is simply part of the overall embodiment of active beauty. Her face conveys a smoldering passion that connote some mysterious longings – desires that are unspoken and perhaps can never be articulated. These images lie at the heart of Zhang Yimou’s expressiveness, and I think Zhang has not found an artistic replacement for that magical ingredient. There is another connection between Zhang and von Sternberg here – that between Zhang’s. Shanghai Triad and von Sternberg’s The Shanghai Gesture (1941). Both films share a common setting, the degenerate world of Shanghai in the 1930s. And both films are overlaid with pessimism about humankind’s abilities to overcome the depravity of hatred and vengeance. But these two film are nevertheless expressions of directors who implicitly express longings for something different – something deeper and more fulfilling about human existence. They are expressing their romantic disappointment that the beautiful wonders of life are so infrequently allowed to come to fulfillment. The only glimmers we have of it here in Shanghai Triad are in the enigmatic glances of Gong Li’s face as she contemplates Cuihua – something hopelessly removed from the life in store for the oppressed Shuisheng, who is, like most of Zhang’s characters, simply trying to endure. The film takes place within 7 days, which is an important number in China as well as an emphasis on constantly being aware of time. Also highlights the difference about how time moves in the city versus on the island.